When you think about summer, vacation and beaches would always comes firsts in any traveler's mind. I love summer and travelling and I am the type of person who can't travel light. I always bring big bag to carry all my stuff everywhere I go so when I need something it always come handy. 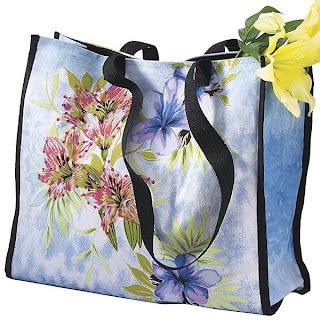 Summer means bold and sunny colors this Lilies Canvas Tote from SerengetiCatalog.com is so stunning and very useful as it can carry all your stuff when you go for a walk or travel, priced at $24.95 with watercolor image. Find summer bags by color, shape and design. For me it's much more important to choose a summer bag by its features than by manufacturer.